As I wrote in the UX with Wifi Direct: The connection acceptance dialog article, there is acceptance dialog, which requires User interaction before any data can be exchanged between the devices. Modify the communications to be handled in a way that no dialogs are ever shown. For the first fix, we could make an app, which you would start and select which mode it would work (either Advertiser who waits for connections, or a devise that initiates the connecting process), and the app would then do connection and once its verified to work be exchanging some data, they would revert the roles and do new round. While running both devices should have the dialog shown once, and user would then need to click the accept button to store the information in “Known Groups” settings. This of course would be required to be handled with each device we can potentially have connections between, and would need to be re-done , in case the device is cleaned. Use createGroup() fucntion from WifiP2pManager to create a group. This creates an access point, with random SSID and password. Do Service Discovery to find any peers nearby advertising their access points. Once found, see what SSID, password and IP-Address are used with there. Stop advertising for the access point. Make connection to the IP-Address you got from the service you discovered in step 4. Its likely that all devices get same IP address when they form the access point, and thus do remember to remove the access point in step 6, otherwise you’ll communicate with your own server in step 7. With Android devices, you can have connection only to one WLAN Access point, thus if you had any active WLAN connections, they will be disconnected when you start connecting in step 5. I made simple example showing how the fix number two works, and you can find it from Github under the DrJukka/MyWifiMesh. Do note that its not fully finalized, and is just used for proof of concept for further development. Windows Server® 2008 includes the DHCP Server service, which is an optional networking component. All Windows-based clients include the DHCP client as part of TCP/IP, including Windows Vista®, the Windows Server®°2003 operating system, the Windows® XP Professional operating system, Microsoft Windows®°2000 Professional operating system, Microsoft Windows°NT® Workstation°4.0 operating system, Microsoft Windows® Millennium Edition operating system, and the Microsoft Windows®°98 operating system. Every device on a TCP/IP-based network must have a unique unicast IP address to access the network and its resources. Without DHCP, IP addresses for new computers or computers that are moved from one subnet to another must be configured manually; IP addresses for computers that are removed from the network must be manually reclaimed. With DHCP, this entire process is automated and managed centrally. The DHCP server maintains a pool of IP addresses and leases an address to any DHCP-enabled client when it starts up on the network. Because the IP addresses are dynamic (leased) rather than static (permanently assigned), addresses no longer in use are automatically returned to the pool for reallocation. Requested DHCP options, which are additional parameters that a DHCP server is configured to assign to clients. Some examples of DHCP options are Router (default gateway), DNS Servers, and DNS Domain Name. For a full list of DHCP options, see DHCP Tools and Options. Wi-Fi Direct (formerly Wi-Fi P2P) is appearing in more and more smartphones these days and despite not having used it so far for anything useful I thought I’d investigate a bit more to see how it works and how it differs from Bluetooth in addition to the obviously higher data transfer rates. Unlike many other Wi-Fi functionalities, Wi-Fi Direct is not specified by the IEEE. Instead, the Wi-Fi Alliance, best known for it’s Wi-Fi certification program and logo, was responsible for the feature. It’s not their first one, they were also the driving force to fix the WEP encryption issue many years ago with WPA and later WPA2. Also, they have defined the set of rules for Wireless Multi Media (WMM) and other options in the IEEE standards to ensure the implementation of a minimum set of features and interoperability between devices. In essense the Wi-Fi direct feature is straight forward. While traditional Wi-Fi networks require an access point for devices to communicate with each other, Wi-Fi direct allows two devices to communicate with each other without a dedicated access point. Instead, one of the two devices assumes the role of the access point and becomes the Group Owner (GO) of the Wi-Fi direct network. Other devices, even non-Wi-Fi direct devices, can then join this group as the GO behaves just like a standard access point. This means that the GO device also includes DHCP functionality to assign IP addresses to clients of the group network. Once the Wi-Fi connection is established and an IP address has been assigned the standard TCP/IP protocol stack is used to transfer data between devices. And this is the biggest difference between Bluetooth and Wi-Fi direct. While Bluetooth defines profiles for transferring images, business cards, calendar entries, audio signals, etc., Wi-Fi direct itself only offers a transparent IP channel. To transfer data between two devices, compatible apps are required. The advantage of this approach is that those apps can work in Wi-Fi direct networks and also in traditional Wi-Fi environments. A TV, for example, that is capable of traditional Wi-Fi and Wi-Fi direct can run a server application to receive pictures and video streams over both Wi-Fi variants. The home owner would stream his material over the traditional Wi-Fi network while visitors would use Wi-Fi direct to skip the somewhat complicated process of joining the local wireless infrastructure network. The disadvantage of this approach in the example above is that the visitor has to first download a client app that can communicate with the server app on the television. While this might be acceptable for the scenario above, it’s too complicated for just exchanging a few images, files or contacts on the go between two smartphones. Perhaps Google will add such apps to Android in the future to make this easier but this wouldn’t help transferring files to the iPhone, Blackberries, Windows Phone, etc. This is where Bluetooth still shines due to its standardized profiles which are implemented on many operating systems. This is a bit unfortunate as transferring multimedia content between different mobile operating systems would definitely benefit from fast Wi-Fi transmissions due to ever increasing file sizes and the practical transfer speeds of Bluetooth of only around 2 Mbit/s. In short, a Service is a broader implementation for the developer to set up background operations, while an IntentService is useful for “fire and forget” operations, taking care of background Thread creation and cleanup. IntentService IntentService is a base class for Services that handle asynchronous requests(expressed as Intents) on demand. Clients send requests through startService(Intent) calls; the service is started as needed, handles each Intent in turn using a worker thread, and stops itself when it runs out of work. The Service can be used in tasks with no UI, but shouldn’t be too long. If you need to perform long tasks, you must use threads within Service. The Service is triggered by calling method startService(). The Service and IntentService may be triggered from any thread, activity or other application component. If you implement a Service, it is your responsibility to stop the service when its work is done, by calling stopSelf() or stopService(). (If you only want to provide binding, you don’t need to implement this method). The IntentService stops the service after all start requests have been handled, so you never have to call stopSelf(). Broadcast Receivers simply respond to broadcast messages from other applications or from the system itself. These messages are sometime called events or intents. 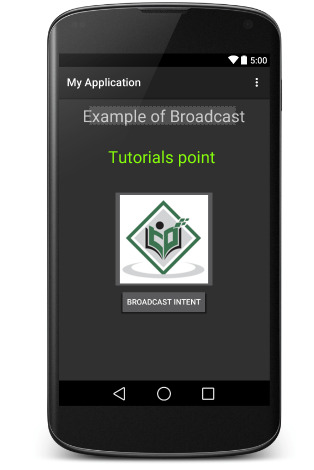 For example, applications can also initiate broadcasts to let other applications know that some data has been downloaded to the device and is available for them to use, so this is broadcast receiver who will intercept this communication and will initiate appropriate action. There is one additional steps in case you are going to implement your custom intents then you will have to create and broadcast those intents. A broadcast receiver is implemented as a subclass of BroadcastReceiverclass and overriding the onReceive() method where each message is received as a Intent object parameter. Now whenever your Android device gets booted, it will be intercepted by BroadcastReceiver MyReceiver and implemented logic inside onReceive()will be executed. There are several system generated events defined as final static fields in the Intent class. The following table lists a few important system events. android.intent.action.BATTERY_CHANGED Sticky broadcast containing the charging state, level, and other information about the battery. android.intent.action.BATTERY_LOW Indicates low battery condition on the device. android.intent.action.BATTERY_OKAY Indicates the battery is now okay after being low. android.intent.action.BOOT_COMPLETED This is broadcast once, after the system has finished booting. android.intent.action.BUG_REPORT Show activity for reporting a bug. 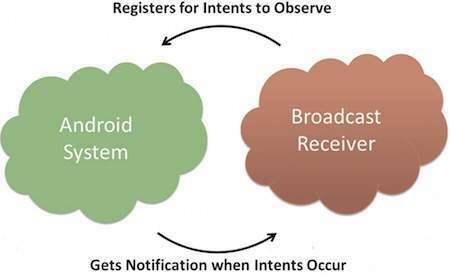 android.intent.action.CALL Perform a call to someone specified by the data. android.intent.action.CALL_BUTTON The user pressed the “call” button to go to the dialer or other appropriate UI for placing a call. android.intent.action.DATE_CHANGED The date has changed. android.intent.action.REBOOT Have the device reboot. If you want your application itself should generate and send custom intents then you will have to create and send those intents by using thesendBroadcast() method inside your activity class. If you use thesendStickyBroadcast(Intent) method, the Intent is sticky, meaning theIntent you are sending stays around after the broadcast is complete. This intent com.tutorialspoint.CUSTOM_INTENT can also be registered in similar way as we have regsitered system generated intent. 1 You will use Android studio to create an Android application and name it as My Application under a package com.example.My Application as explained in the Hello World Example chapter. 2 Modify main activity file MainActivity.java to add broadcastIntent()method. 3 Create a new java file called MyReceiver.java under the packagecom.example.My Application to define a BroadcastReceiver. 5 Modify the default content of res/layout/activity_main.xml file to include a button to broadcast intent. 6 No need to modify the string file, Android studio take care of string.xml file. Following is the content of the modified main activity filesrc/com.example.My Application/MainActivity.java. This file can include each of the fundamental life cycle methods. 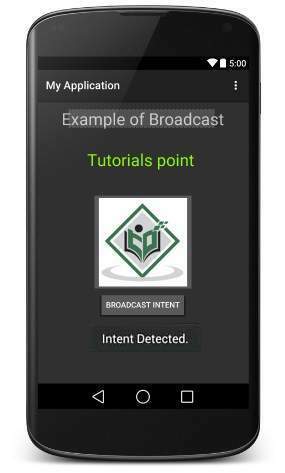 We have addedbroadcastIntent() method to broadcast a custom intent. You can try implementing other BroadcastReceiver to intercept system generated intents like system boot up, date changed, low battery etc.